Last I counted, there are at least 15 USB flash drives scattered across my desk. We get them when public relations companies send over review units, at press events, or as swag at industry parties. If USB flash drives became currency one day, technology journalists would be the richest people in the world. But they’re not. Flash drives are a way for PR companies to consolidate information into a compact package so we can pay attention as we try a new product, instead of taking spec notes. Unfortunately, after the article is said and done, the USB drive goes back into a drawer where many of its cousins reside, never to be touched again. It’s a waste of plastic and perfectly good technology. To combat this uneconomical practice, Andrew DePaula and team have invented the intelliPaper. At first glance, it looks like your average cardboard paper with silver prints at the end. But tear this perforated edge out and stick it into your computer’s USB slot and you have a functioning, flash drive. It’s an ingenius response to the increasing use of USB technology in a recyclable, disposable way. And in turn, we no longer have to feel guilty for hoarding little plastic drives. 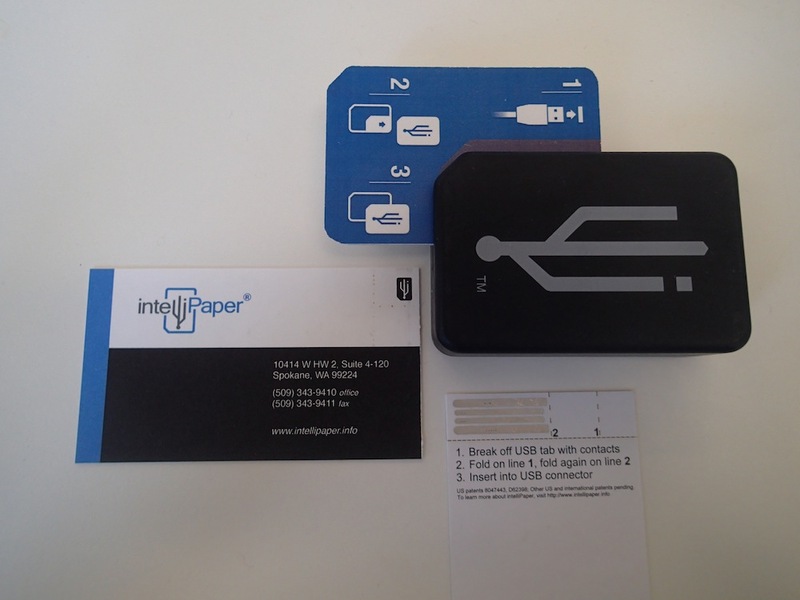 The intelliPaper team sent over a press kit to visualize how practical paper USBs can be. 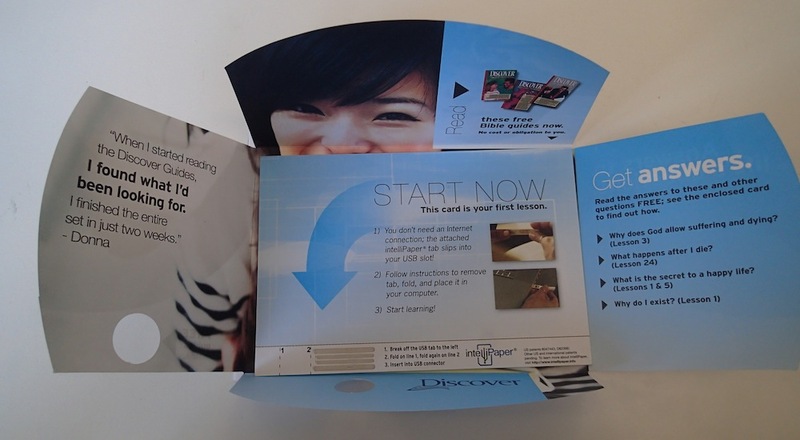 In it, we find a university pamphlet with a detachable intelliPaper strip at the bottom for more information, a postcard, and a few business cards. There’s also a stone-shaped reader that connects to your computer via mini USB cord if you’re uncomfortable with jamming a cardboard strip into your drive. These sample applications allow companies to provide additional information without the bulk and waste of plastic, and customize them in a practical and effective manner. With his Indiegogo project freshly launched, he aims to create a version where people can write their own files to the drives and print them on pamphlets or business cards of their choice. 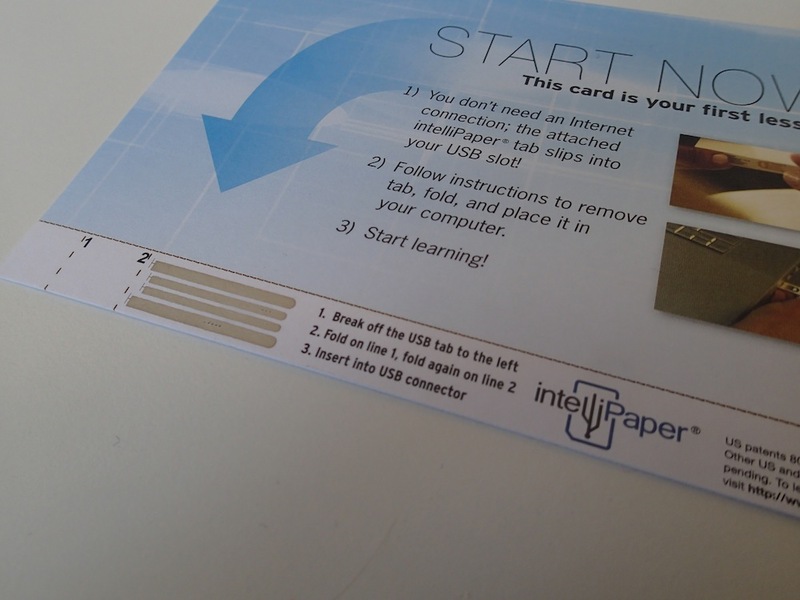 The secret to intelliPaper’s design is to strip a traditional USB drive to its core. 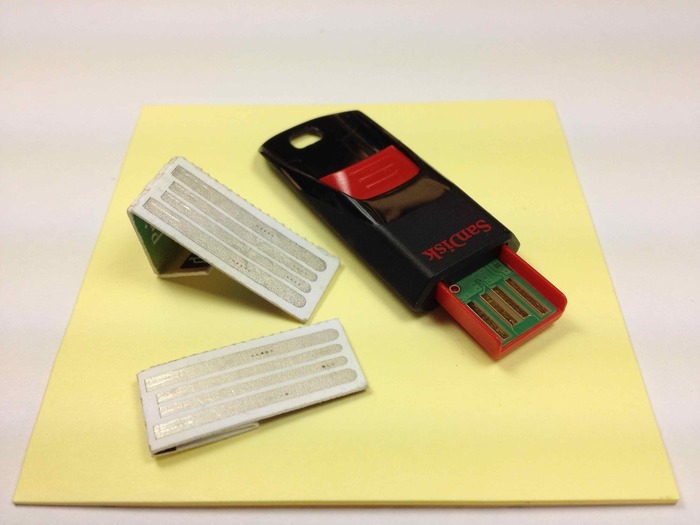 DePaula did away with the bulky plastic housing and embedded the same silicon flash memory in the paper, thus creating a paper-thin USB drive. In our initial use, we found intelliPaper quite intuitive. For disposable, one-time-use purposes, intelliPaper is an excellent way to curb manufacturing costs on drives. Not that there is a mobility issue with USB drives, but flattening it to the thinness of paper also makes it mailable in a regular envelope. Why is this important? Let’s be frank: People are curious. Even if you don’t care about the info kit that was sent to your house, if it comes with a paper USB, you’d at least want to stick it in your computer and see what’s up. 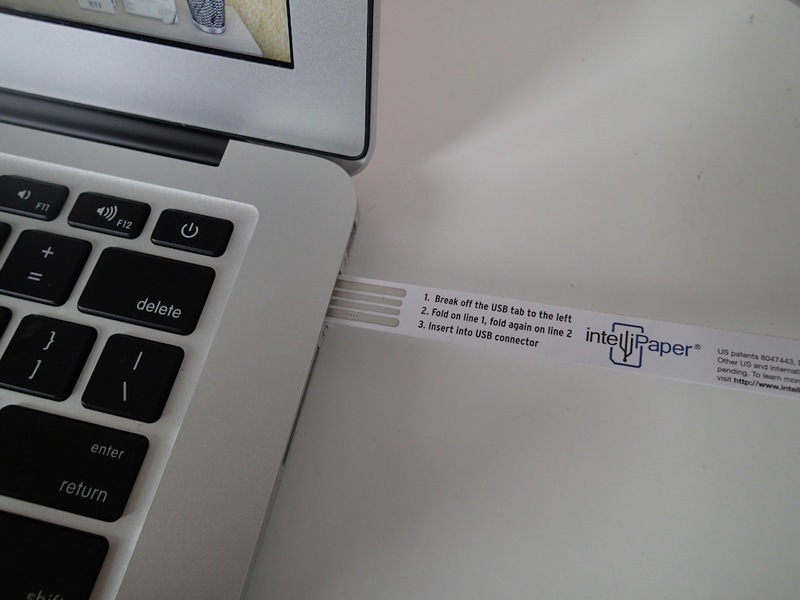 From a business card standpoint, this is also a unique way to program your portfolio, website shortcut, or resume into the intelliPaper strip instead of where QR codes may currently be. One could argue that all this could be resolved if we just resorted to Web addresses. But the truth of the matter is, USB drives – outside of their storage utility – have become a way for companies to advertise and reach new audiences. Although the drives are still somewhat expensive at the Indiegogo funding of $100 for ten 8-32MB drives, like any new product, the price should go down with scale. The possibilities seem infinite. When those days come, the only plastic USB drives I’ll own are the ones I actually want, use, and need.